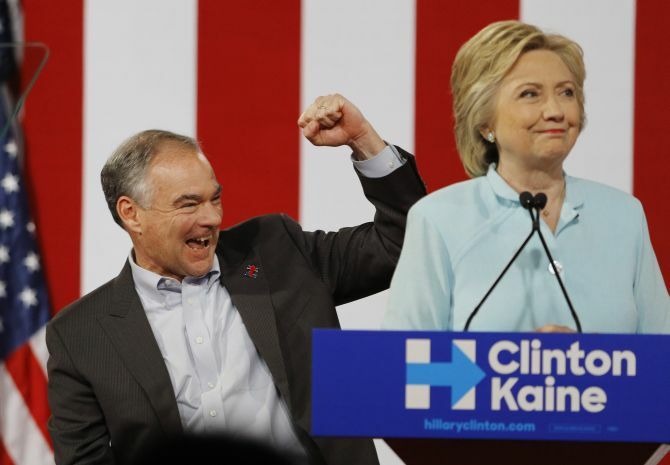 On Friday, US Democrat presidential nominee Hillary Clinton named Virginia Senator Tim Kaine as her White House running mate for the November general elections. 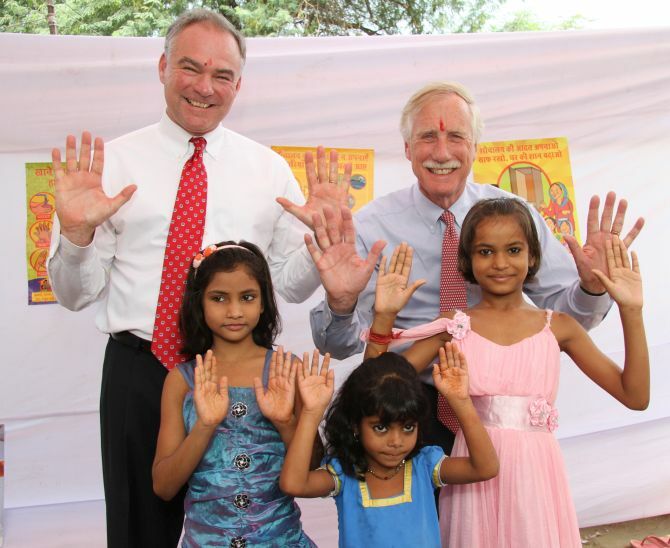 Kaine was one of the first senior US government officials to visit India after Prime Minister Narendra Modi’s October 2014 visit. 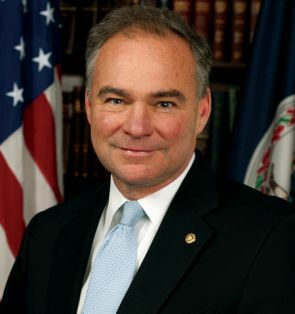 In view of his selection as the Democrat running mate, Rediff.com reproduces this 2014 interview with Kaine where in he discusses with Aziz Haniffa the new opportunities to foster Indo-US trade and the improvement in ties. United States Senator Tim Kaine, reflecting on his recent trip to India, said he not only saw new opportunities to foster US-India trade and economic ties under the Narendra Modi government, but also saw the necessity to ante up joint counter-terrorism cooperation. Kaine, chairman, Senate Foreign Relations Subcommittee on Near Eastern and South and Central Asian Affairs, which has jurisdiction over matters pertaining to the Indian Subcontinent, was accompanied by Senator Angus King, an independent from Maine who serves on the Armed Services and Intelligence Committees on the four-day visit to India, and thereafter to Pakistan and Afghanistan. In an exclusive chat with Rediff.com, Kaine chats about the trip and the road ahead. As chairman of the Foreign Relations Subcommittee on Near Eastern and South and Central Asia, I had a hearing this summer about the new chapter in US-India relationship and we heard from both administration witnesses and private sector witnesses too. So, from afar, I really viewed the transition to the Modi government as opening up some new opportunities for cooperation. I wanted to explore that in detail in two areas -- in the military/security area and then also in the economics area. I walked away from the trip thinking my perception from afar that there are new opportunities is right because there really seemed to be a number of opportunities to deepen the India-US relationship, whether you are talking government to government or private sector to the government. For example, military procurement opportunities or private sector to private sector, there is a real excitement about deepening the US-India relationship. Could you give a gist of your discussions in New Delhi -- who you met with, what the dialogue centred on, and the understandings reached? In Delhi, we met with senior governmental officials, parliamentarians, National Security Adviser Ajit Doval and think tank experts, mostly those of whom had been connected with the government or Parliament some time in the past, but were now kind of in the independent think tank world, and we talked about a lot of different items, but again, the big picture takeaway was that for a variety of reasons, this government seems more open to partnerships with the United States, this government seems more open to partnerships with the private sector. So, for example, in some of the defence-related industries, there has been a strong tradition of only purchasing weapons platforms for example from state-owned enterprises, but that is now changing and there are more opportunities for private enterprises -- certainly Indian private enterprises -- but also others to participate. We see an uptick in the number of exercises -- military exercises -- that the US and India are doing jointly. India joined the Pacific RIMPAC naval exercises this summer for the first time and there are a lot of joint exercises that are underway. And, then, we certainly see a common thread of terrorism and so the opportunity to participate together in counter-terrorism, sharing of intelligence, training, sharing best practices. I visited two sites connected with the November 2008 attack in Mumbai by the Lashkar-e-Tayiba group and it’s very, very moving to go to the Café Leopold and have dinner with the owners there and hear them talk about what happened that night and moving to be at the Oberoi Hotel and go to the memorial there for the patrons and the staff members who were killed and talk with the hotel folks who had been there and get their take on it. So, obviously, both our nations bear the scars of terrorism and that means we both have a strong desire to work together to fight it. The Senate was in recess during Modi’s visit for his summit with US President Barack Obama, so you didn’t get an opportunity to meet him. Were you disappointed that you couldn’t meet him in Delhi? I would have loved to have met the prime minister, but his schedule would not accommodate that. But, of course, we would have been thrilled to do that, but we did have a very, very good session with National Security Adviser Doval. Senator King and I serve on the Armed Services Committee together and I am on Foreign Relations and he’s on intel (Intelligence Committee), so the main purpose of this trip was the national security/military side, and by meeting with Adviser Doval we felt that we were talking to somebody who gave us good insight about the relationship. As you know, Doval stayed back in Washington, DC after he accompanied Modi here to DC, and met with his counterpart and senior intelligence and Pentagon officials, etc. Did he give you his take on how these meetings went and how much of a strategic partnership is being envisaged in these specific areas? I don’t want to put words in his mouth, but generally he found the meetings to be very productive. The fact that he stayed behind and had more in-depth meetings is an indication about what he thinks about the relationship and we believe it as well. The terrorism issues are very troubling to India and the United States just using Islamic State as an example in Iraq and Syria. There are millions of Indians who live in the countries that are most affected -- Iraq and neighbouring countries that can be most affected by IS. Even as we were meeting, there were a number of Indian construction workers in Iraq whose whereabouts were unknown with the strong suspicion that they might be under captivity by IS. So, a lot of Indians face this threat abroad, but also even at home. Al Qaeda has announced an intent to start activities in the Indian subcontinent and with the very real scars left behind by the terrorist attacks on November of 2008, certainly Adviser Doval understands the threats and is looking for good partners to try to mitigate the prospects of catastrophes like the November 2008 attacks. In your meetings with the senior Indian government officials, did you encourage India to join the US-led coalition against IS? Absolutely. Anything that India could do to be helpful, we would appreciate it. The coalition is a broad coalition already with a number of nations and each nation is setting the terms of its own engagement. It’s not like… there’s a one size fits all. So, hopefully (India will join), and the prime minister had strong words at the United Nations about IS representing a threat to humanity and we really appreciated his strong statement on that when he was at the UN. Rewinding on to some of the US-India trade issues where there has been a lot of US concern about intellectual property rights and India’s torpedoing the Trade Facilitation Agreement at the World Trade Organization, did you bring up these concerns? We did talk about them, (but) I am not the trade negotiator and we don’t speak for the administration. So, we weren’t in a position to hash them out and find resolutions. We explained the US position and Indian leaders explained their position. But we all share the goal that trade between the United States and India has grown five-fold since the early 2000s, which is a spectacular trajectory. I think both -- the Indian governmental and private sector leaders and we -- view that as only the beginning. We believe that it can be much, much more. We shared our view of that and the fact that we want to do what we can to make that happen. Besides Delhi, you also visited Mumbai. Can you speak of your visit there and your meetings with the leaders of business and industry and the thrust of your discussions? The Mumbai visits were very productive. We visited the Mazagon Docks, which I really enjoyed to have a chance to see. Now, that is a state-owned company, (but) it runs like a private company. We had three roundtable sessions. We had a roundtable with Indian CEOs to talk about, first, their perception of this moment in Indian political and economic life, their level of optimism about economic acceleration, but also about opportunities for US-India business to business relationships. We then had a similar roundtable, but this time it was with the CEOs of American companies operating in India, so it would largely be multinationals, with a significant India presence and the CEOs of the Indian operations. And, again, it was to talk about the same issues and getting their take on the possibilities for deeper ties. Then, we had a meeting with the CEO of the Tata Group, Cyrus Mistry, and that was a very good meeting -- he and a number of his division heads met with us. Looking at their levels of optimism, about economic acceleration under the new government, which were high and they shared what they thought some of the challenges were that the government faced, just like any government faces challenges. They shared those, but they have a real sense of optimism about this moment and particularly, the opportunity for deeper US-India business to business relationships. After Delhi you went to Pakistan and met Prime Minister Nawaz Sharif, Chief of Army Staff General Raheel Sharif, the Adviser to the Prime Minister on National Security and Foreign Affairs Sartaj Aziz, and a number of parliamentarians. There has been a lot of tension between India and Pakistan in recent months over Pakistan’s violation of the Line of Control. India, in fact, cut off the scheduled talks with Pakistan over these continuing violations. What were your discussions with the Pakistanis in terms of alleviating these tensions in Delhi and in Islamabad? There are two issues. First, a desire to just find a ceasefire along that border. I am aware that skirmishes along the Line of Control happen every year to some extent. But what we heard in both India and Pakistan was that the activities this year have been more aggressive than they’ve been in the past. It’s more significant, with more civilians being affected than in the past. So, certainly, the immediate desire, since civilians are being affected by this, is for there to be ceasing of these activities along the border. We certainly shared our strong hope for that both with Indian and Pakistani officials. Long-term, the issues between India and Pakistan need to be worked out in bilateral dialogue between those countries. We also encouraged that and I know there’s a regional meeting coming up in the near future of nations in the region -- a SAARC regional meeting -- and it’s my understanding that both prime ministers will attend. I thought it was very positive when Prime Minister Modi invited Prime Minister Sharif to his swearing-in as prime minister and the fact that they spent one-on-one time together was a positive sign. I hope there is some dialogue between them or between their high level officials soon because both countries have a lot to gain by a peaceful border. You also visited Afghanistan. How much of a discussion was there on Afghanistan during your meetings with Indian and Pakistani officials? Both in India and Pakistan, we heard a lot about Afghanistan, especially praise for US efforts in Afghanistan and there was a sense of relief that the electoral stalemate was resolved with the formation of a government of national unity and some excitement about that. Both officials in India and Pakistan, were saying to us that the US needs to remain involved and we really stressed that the US involvement post-2014, while we are moving into a new chapter, it’s not the final chapter. They needed to be assured that the US involvement is just not going to come to an end within a couple of years. We really tried to assure them that the commitment we have to Afghanistan is significant and reiterated that we are moving into a new chapter, but it’s not the final chapter. It’s interesting that while India and Pakistan have many differences, the tenor of their discussion with us about Afghanistan and the US role in Afghanistan, they were saying exactly the same things.